An easy way to identify wild rosemary is the thin needle-shaped leaves that are arranged in tufts along the branches. These light grey, green leaves are designed to reflect sunlight thus reducing leaf temperature. The minute, silvery hairs covering the leaves trap moisture to reduce transpiration. The aromatic oils from the leaves are also thought to help reduce water loss. You can find these plants all along the paved pathways and in the Indigenous Garden. Crush a leaf and enjoy the fresh, sharp, sweet aroma. 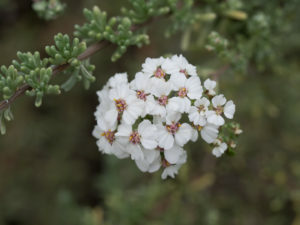 Bees and other insects take the nectar from the small white flowers. The fruit is covered with long, white hairs and when dried the seed head resembles cotton wool or snow. (Kapok refers to snow in Afrikaans). Wild rosemary has traditionally been used as a medicine for many ailments like coughs and colds, flatulence and colic, as a diuretic and a diaphoretic. A tea is usually made with 1 cup of boiling water and a sprig of wild rosemary. In her book on indigenous herbs, Margaret Roberts mentions that wild rosemary seems to have similar qualities to ordinary rosemary as both have an invigorating effect on the skin and hair. She suggests boiling springs of wild rosemary (1 measure of twigs and flowers to 2 measures of water) for 15 minutes and when cooled to add it to the bath or to use as a hair growth stimulant and conditioner.